1. Does all of the information get stored in the tag? No, the tag just contains a number that becomes the serial number of the product. When the tag is scanned the serial number is transferred to the tablet. When information (pre-pour, post-pour inspections, etc.) is entered on the tablet, it is stored in association with the product's serial number. This way a timeline history of each product can be retained. 2. Can we see the product's location on a map of our yard? Yes. 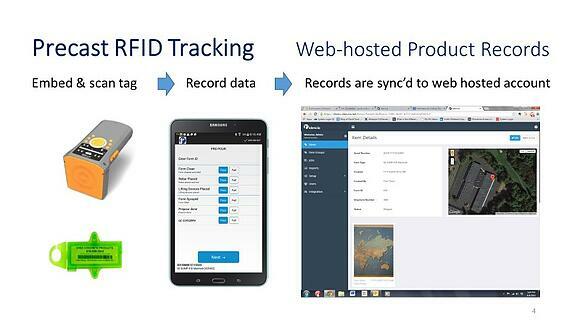 GPS tracking is one of the biggest reasons why producers want RFID tracking. Scan the product at the time its placed in the yard... or delivered to a customer... and the location will be visible on Google maps. 3. How do the tags get embedded in the concrete? They can be embedded any number of ways: attached to the form prior to pour; slid in on the inside of the form after pour; floated into the concrete after the pour. 4. Can we use our own numbering system? Yes. Concrete tracking systems will perform equally well using bar code labels instead of RFID tags. Producers that want to apply their own nomenclature in the creation of the serial number can print their own bar codes on labels that are designed to adhere to concrete. 5. Do we have to learn a new software system? No. A good concrete tracking system will be completely configurable. The questions asked on the tablet will reflect the questions that would otherwise be seen on the clipboard. 6. Do we have to integrate with our IT system? No. web-hosted systems are accessed through your web browser and do not need to work through internal IT systems. Another advantage of this is that the information can be obtained from any computer, tablet or phone... anywhere. For any technology offering to be effective, it must be simple and customized to the needs of the customer. A good precast RFID tracking system will provide both to the producer. 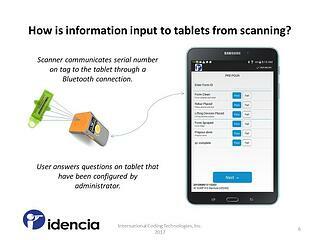 Our purpose at Idencia is to offer precast RFID tracking solutions that improve productivity throughout the value chain. Our subscription offering applies to products from the time of manufacture through end-of-life. As a cloud-hosted product tracking system that is seamless between manufacturers, contractors and asset managers, Idencia adds information value to all, eliminates redundancy and saves time. If you would like to learn more, click below.